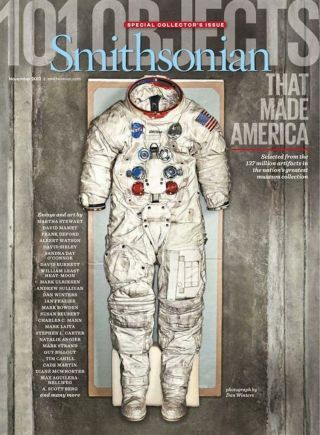 Neil Armstrong's spacesuit appears on the cover for Smithsonian Magazine's special collector's issue, "101 Objects that Made America." Astronaut Neil Armstrong's spacesuit rubs shoulders with Muhammad Ali's boxing robe, as well as Lewis and Clark's compass, Abraham Lincoln's top hat and Alexander Graham Bell's telephone in a new list of the 101 objects that tell the story of the United States. Several artifacts from the nation's efforts to explore space are included on the list in Smithsonian Magazine's special issue, "101 Objects That Made America," which debuts on sale on Tuesday (Oct. 29). The list's contents were "drawn from the 137 million artifacts held by the 19 museums and research centers of the Smithsonian Institution," editor-in-chief, Michael Caruso, writes. The retired space shuttle Discovery, on display at the Air and Space Museum's northern Virginia annex, the Steven F. Udvar-Hazy Center, and the Telstar satellite, which is represented by a backup unit and third-scale model in the museum, are also among the issue's 101 objects. The space items also cross over into two similar projects by other Smithsonian media properties. Armstrong's suit and shuttle Discovery are included in the new book, "The Smithsonian's History of America in 101 Objects," written by the Washington institution's under secretary for history, art and culture, Richard Kurin. His overall list differs from the magazine's by 50 items. The Smithsonian Channel is also set to feature many of the artifacts in its four-part TV series, "Seriously Amazing Objects," premiering Nov. 25. "No one knows what Columbus was wearing when he set foot in the New World, but on July 20, 1969, when Neil Armstrong took his 'one giant leap' onto the Moon, he was clad in this custom-made spacesuit, model A7L, serial number 056," historian Andrew Chaikin writes in his essay for Smithsonian Magazine. More than just a garment, the spacesuit was a one-person spacecraft, requiring both cutting-edge technology and Old World craftsmanship. Close-up of astronaut Neil Armstrong's Apollo spacesuit, as seen being preserved at the Smithsonian in 2008. "Here was this almost mythic thing, this item that allows human beings to walk on the moon," Kurin told CBS News in a televised interview on Saturday (Oct. 26). "Who would have imagined such a thing was possible?" In fact, it took seamstresses who were more familiar with ladies' undergarments than the rigors of space exploration to hand-sew the suits to precise detail. "When it was first designed, it was designed by engineers. It was supposed to be fiberglass and hard — it was a guy thing. That would not allow Neil Armstrong to walk on the moon," Kurin remarked. "What was necessary was a suit that would give him flexibility." "So who won the design competition? International Latex Corporation, otherwise known as Playtex. Neil Armstrong took a large step for mankind, but an even bigger step for ladies' girdles, underwear and flexibility!" he exclaimed. As related by Chaikin in the magazine, Armstrong sent a letter of appreciation for his spacesuit to NASA. "It turned out to be one of the most widely photographed spacecraft in history," Armstrong wrote in 1994. "Its true beauty, however, was that it worked." Kurin said the list of 101 objects were compiled based on the recommendations of hundreds of curators and that it included items that were deemed "icons of the American experience." The list was also culled from what the public was drawn to in the museums. "We get 30 million people a year to the Smithsonian and they go to certain objects, gravitate to them, so we had to have those," he told CBS News' "This Morning." Two of the objects on the list were responsible for bringing the public closer to space — or space closer to the public. The Telstar communications satellite, which relayed the first trans-Atlantic television signals in 1962, "brought the world into America's living rooms," the magazine's editors described. "Amid the rising tensions of the cold war, many viewed Telstar as a literal beacon of hope." Whereas, space shuttle Discovery was included in the list for making "space a frequent destination." One of the newest additions to the Smithsonian's space collection — it was transferred in 2012 after flying its final mission the year earlier — Discovery and its sister ships in the now-retired shuttle fleet, "threw space open as a place where ordinary men and women could not only live, work and fool about ... but also routinely slip the bonds of time," Smithsonian Magazine quoted the "Economist" as writing. For more information, see Smithsonian Magazine’s special collector’s issue, “101 Objects that Made America,” on newsstands Tuesday (Oct. 29) and online at smithsonianmag.com.